ke Solutions - ke Solutions web design project news and press releases - Livestreaming: a big something or a small nothing? Livestreaming: a big something or a small nothing? Take some time and examine The Conversion Prism: some names will surely be familiar, others will ring a bell and many won’t mean a thing. 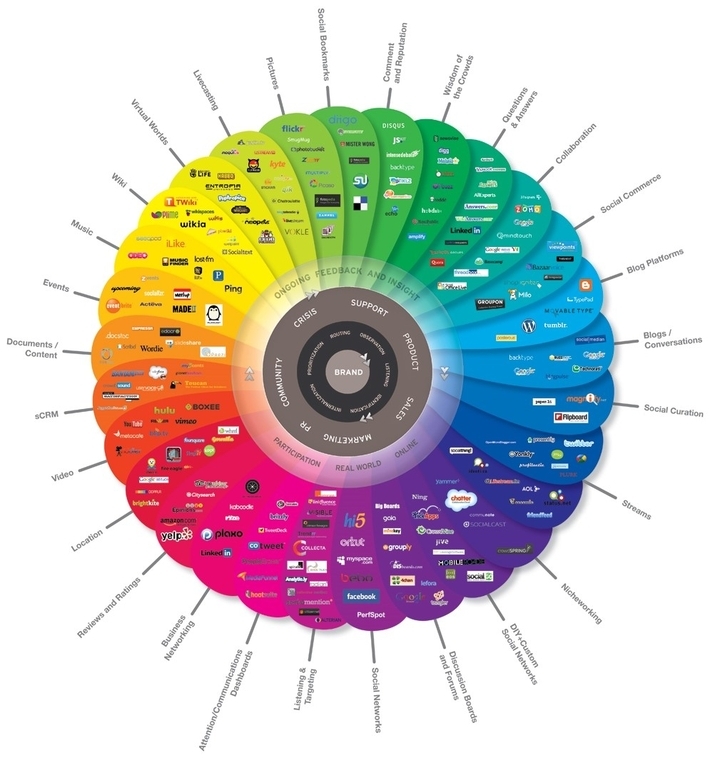 But there is no other way to visualize just how complicated is this thing we call "social media". The average person associated social media with Facebook, Twitter, Instagram, Pinterest, etc, even the phenomenon is way bigger than social networking, video and/or picture sharing. Nevertheless, the whole colorful panoply of social media shares some fundamental features. Were I to ask you a simple question - what exactly the social media user is contributing to social media or what type of interactions users have among themselves? - you will instantly think of posts. Indeed, we post on social media: we post text, we post images and we post videos. This is a fundamental aspect of our current understanding of social media, a paradigm of sorts. And, as all paradigms, it is starting to show signs that it is about to be challenged. I am talking, of course, about livestreaming. A big something or a small nothing? Livestreaming is different because livestreaming is not a exactly a post. Rather, you go live and offer your audience a live performance. A fundamentally more active form of contribution and interaction. One way of picturing this is by imagining podcasting with video plus no post-editing. Academic interest aside, the core issue is whether livestreaming is a new type of user contribution. If so, every company that has an online presence (which, nowadays, is pretty much everybody) needs to start thinking about what would a post-"posting" world entails. It was in this context that we recommend you have a look at Connie Chan’s "16 Observations on Livestreaming in China". She notes that livestreaming is growing rapidly and the primary reason why you don’t know about it yet has to do with the fact that this happens in China. Also note that others have already pointed out that China arguably outpaces Silicon Valley when it comes to mobile innovation; if you are not convinced, here is a link to NYT’s recent "China, Not Silicon Valley, Is Cutting Edge in Mobile Tech" by Paul Mozur. I am mentioning this to lend additional weight to the idea that livestreaming may well be a big something rather than a small nothing. Recent developments at Snapchat seem to point in the same direction. Evan Spiegel might be onto something when he said "...people wonder why their daughter is taking 10,000 photos a day. What they don’t realize is that she isn’t preserving images. She’s talking". Meaning: she is communicating visually. Visual-heavy communication seems to be the reason for their decision to launch Specs - a pair of sunglasses that can take 10 second videos and send them to your snapchat account. You will be communicating visually. Livestreaming: what can you use as business? I will not go through Connie Chan’s list of (thoughtful) observations, but just take a couple that I think have struck me as being having "predictive" value. First, there is the fact that digital gifting seems to working and even working well. There are, of course, many reasons (probably inscrutable) a person decides to blog / podcast or livestream. But there are also some pretty transparent economic reasons to it too. Livestream viewers buy digital gift for a broadcaster, while the creator splits the income between the app store, the broadcaster, and the livestreaming platform. At least in China this novel monetization model can be so successful as to allow people to quit their day jobs and focus on livesteaming exclusively. Note that the flipside of this is that this model is sweeping the rug under the feet of advertising monetization model; according to the data cited in the article, online advertising accounted for ever decreasing net revenue proportions - 9.0% in 2013, 4.0% in 2014, 1.1% in 2015. Secondly, brands discovered that livestreaming product reviews, product launches or time-limited discounts makes selling much easier, more natural and a lot cheaper. Similarly to the youtube influencer, the livestreamer is also an influencer, albeit on a much more open platform. The simplicity and the lack of apparent production makes the livestreaming influencer appear much more sincere: in a way he or she is just like the viewer. Thus, an endorsement of a musical album or a pair of shoes or a specific mobile service is so effective. At ke Solutions we make websites and apps; but we also try to think long-term as well. Should we be thinking about incorporating livestreaming in our websites and apps? What are the best use-cases? What do you think?